**This post was originally published in June 2014, and I want to make sure that all of you could find my tutorial easily so I have reposted it here. I hope that you enjoy and spread the word about such a great way to present your birth plan to your providers! A birth plan is a short document to take with you to Labor and Delivery that lets the providers there know what your preferences are during labor. It is important to keep your birth plan simple and easy to understand. Providing a copy to all those involved with your labor can eliminate miscommunication, help labor go smoother, and keep your wishes from being dismissed. 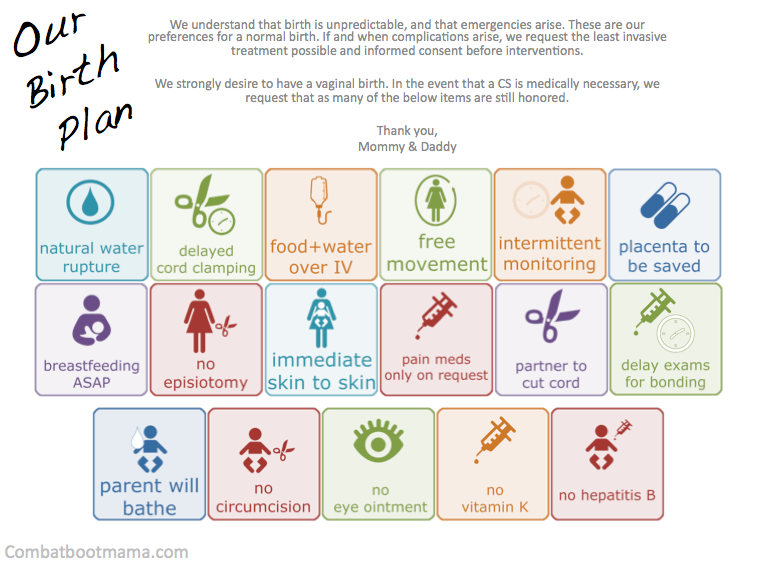 Her Visual Birth Plan was an inspiration, and I have created my very own! 1. I found the icons for the plan on Imgur, and you can download all 57 of those images by clicking here. The icons include a wide variety of options and your plan will be completely customizable! They were originally made by Seanna for the BabyBumps group on Reddit! She did a great job making the icons easy to understand, and includes a lot of options. You can check out her page here. 2. I opened Microsoft Power Point on my desk top. I added my personalized message to my providers by using a text box positioned at the top of the slide. 3. I added each Icon that I wanted to the presentation by selecting “Insert Picture.” Then, I made sure that they were all the same size by formatting each picture to be 1.5″ wide and 1.5″ tall. You can do this by right clicking on each icon and select “Format Picture.” Then go to the “Size” page and change the Height and Width to 1.5″ each. 4. I then changed the colors of my icons to make it more fun and inviting. You can also leave them the red and green colors found in the original icons. To change the colors of the icons, right click on the image you want to change and select Format Picture. Then select “Recolor” from your Picture formatting tab in your Formatting Palette. You can choose a color from the list or select a custom color as well. 5. I saved my presentation to my computer. Once I need it, I can print it out and take it with me! Simply print the presentation with one slide per page and it will print beautifully! Did you make a birth plan for your birth? What did it look like? Share your pictures with us at CombatBootMama@gmail.com we would love to feature them on our Facebook page!